Spring in Maine is sometimes colder and actually involves more “gathering up” than Fall harvest time. This time of year at Veggies For All, we amass our stock of seeds (thanks, Fedco! ), soils, materials, and tools- like other small farms. We call and email our volunteers to rally them for the many transplanting tasks ahead. Our crew members and volunteers lumber out into the fields, not yet limber from gardening or swimming or hiking. We all stand at the weedless field’s edge, zipping our jackets up to our chins. Veggies For All (VFA) is food bank farm located in Unity, Maine that works to relieve hunger by growing vegetables for those in need, while collaborating with partners to distribute and increase access to quality and nutritious food. Founded in 2007 by beginning farmers, VFA is a project of Maine Farmland Trust that has grown and distributed 130,000 pounds of fresh produce to 1,500 people utilizing food pantries in the greater Unity area. We ask volunteers planting the onions to be sure the delicate roots are completely covered in soil and to make a shallow “well” at the base of each plant. Yes, the slight impression we make with our fingers does catch rain water that helps keep the plant hydrated. But, we also like to think of this step as a little blessing, an extra connection between the transplanter and the transplanted. Volunteers, even very young ones or those who do it differently in their home gardens, are eager to please. 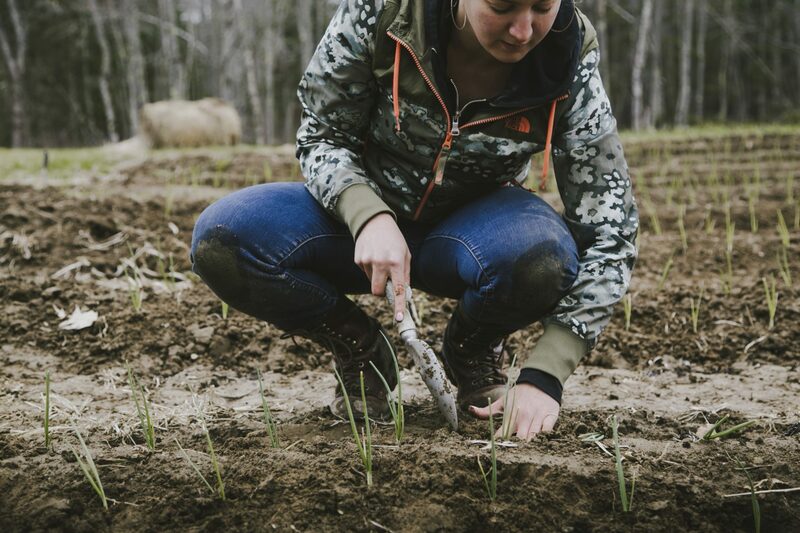 Each year, VFA grows nearly 10,000 onions for eventual distribution to Mainers facing food insecurity. The task of growing and transplanting these onions is not just a sensitive agricultural task, but an apt metaphor for organizing in community, because we aim to pull in many hands at just the right moments. We enlist skilled staff to seed and closely manage the onions through the early Spring, with our student workers supporting the effort by watering, monitoring, trimming, and thinning. Our farm manager cultivates a well-amended field at the proper place in the crop rotation, forming tidy beds. Untrained youth volunteers and longtime gardeners alike step into the field, tiny onion seedlings in hand, to get instruction on just where and just how to “plug them in” to our neat, vast grid. In a couple months, these slight wisps of green will turn into hearty yellow, white, and purple bulbs to be gathered in heavy black crates. Our small truck beds will overflow with onions on their way to be laid out, cured, and trimmed in the greenhouse before Winter storage. If weather and whim cooperate and if we do our job properly, the crop will make its way to 1,500 of our neighbors utilizing local food pantries. They’ll sit on kitchen tables, crowd cabinets, and sizzle in sauce pans across central Maine. We can smell it already.